After you’ve been with EA for seven years, they give you an extra seven weeks of vacation which they call the “sabbatical”. That’s above and beyond the four weeks I normally get off and the week everyone gets at Christmas. So, there’s no way I’m going to be able to take off seven weeks all at one time, so I’m dividing it up into three parts. I took a week at Thanksgiving. I’m taking two weeks here at Christmas and then I’m going to take four weeks once the game I’m working on ships. So, I started my first week off this week and I don’t have to go back to work until January 9th. I decided to treat myself to some lunch all on my own today. I went up to our favorite pizza place, American Pie. It was good being free from the kids just eating pizza and reading my book. Later on in the afternoon it was time to rock. Jennifer went to a hair appointment and since she doesn’t care for Rock Band too much, it was time to get out the drum set and rock. I first looked over to see if there were any new songs to download from the music store. I picked up “My Sharona” by The Knack, one of my dad’s favorite songs. Mainly because he claims to have come up with the melody for the song. I’ve completed all the solo drum songs on “Easy” and now I’ve started going through all of them on “Medium”. Well, it appears I rocked too hard, because I think I pulled something in my ankle. I can barely move my foot around. In another bit of news, Abby pulled her other top front tooth out tonight. 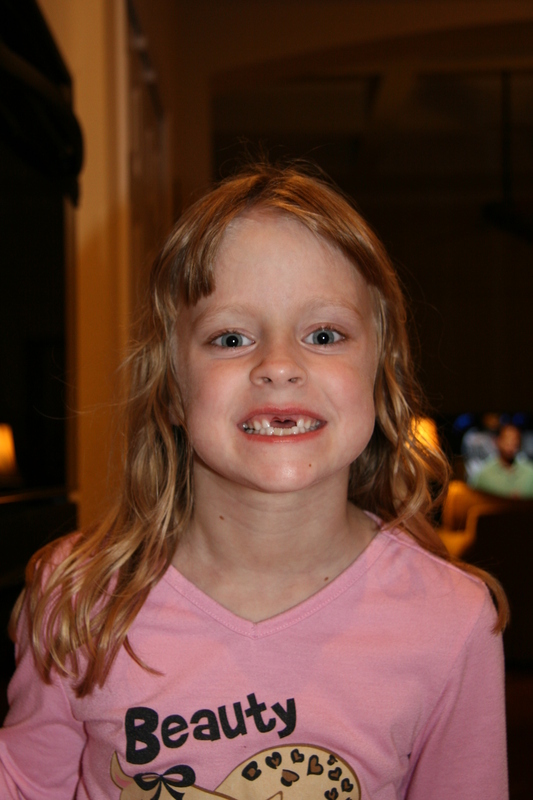 So, she will be getting another visit from the tooth fairy and she will be without her two front teeth for Christmas. She was very exciting when it started bleeding coming downstairs and to inform the entire family. She then spent the next thirty minutes wiggling it until it finally broke free. This entry was posted in Abby, Electronic Arts, Games, Jason by Jason. Bookmark the permalink.